Knowing what to do following the death of your loved one can be overwhelming. Aside from the immediate, practical considerations such as arranging a funeral, and obtaining a death certificate, there are other, less obvious things you might not have given as much thought to during this upsetting time. These days, much of our time can be spent online including how we spend our leisure time and consume entertainment. With this brings a new set of considerations following a loved one’s death. This blog post will detail how to cancel their leisure and entertainment accounts, including Netflix, eBay and Xbox Live. If you have access to the email address associated with your dead loved one’s Amazon Prime account, then you can email Amazon Customer Services from their email and request the account is closed. Alternatively, if you do not have access to their email, the Amazon customer service number in the UK is 0800 279 7234. The customer service operator should be able to walk you through the process of closing their account. It’s worth bearing in mind that if your loved one owned a Kindle or had content stored in an Amazon Drive and/or Prime Photos account, and you have the account closed, you'll no longer have access to any of this content or the subscriptions associated with this account. Once the account is closed, the Amazon Drive and/or Prime Photos content will be deleted and cannot be restored. If you are yet to cancel your loved one’s bank accounts, you will need to access the Netflix account in order to cancel unnecessary, recurring payments. If you know the email address associated with your loved one’s Netflix account, you can simply cancel this recurring payment via the Netflix admin settings. 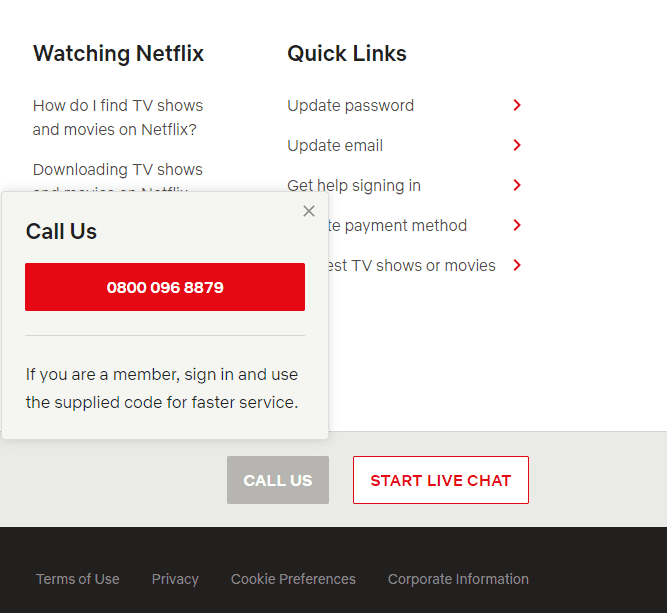 If you can’t gain access to the email or account information, contact their customer support at The Netflix Help Centre and explain what has happened. It is possible to speak with someone either via an 0800-phone number or through live chat (below). 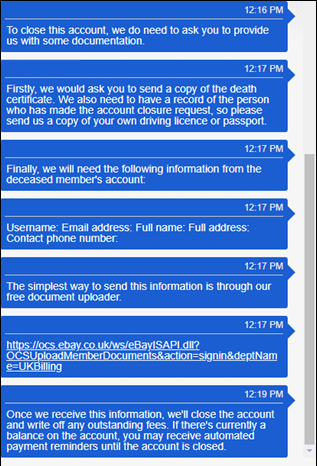 The customer support operator will ask for a method to verify your identity and the deceased’s identity and cancel it for you. PayPal customer service request the following documents from you in order to process closing the account of someone who has died. Once you have these documents to hand, you will be required to speak to PayPal by phone. You can find details of how to do this here. Additional information about closing someone’s account can be found here. Spotify will not delete the account of a dead person unless you contact them and request they do so. Whilst they do not appear to have a dedicated page that documents this process online, there are various ways to get in touch with Spotify customer services. According to a Spotify Community forum, they typically ask for confirmation details such as card number/email address in order to process the closing of an account. Any content associated with a loved one’s Apple ID, i.e. iCloud content, will be terminated upon death. Any apps and media also associated with the account will no longer be accessible. Apple support are able to help with the process of closing an Apple ID. The information required to do this is the persons Apple ID, email, password and death certificate. It is possible to talk to a representative via phone, chat or email. Xbox Live is a subscription service associated with a Microsoft account. Simply closing a Microsoft account does not cancel any of the subscriptions associated with it. Both the act of closing a Microsoft account/cancelling associated subscriptions requires a login (email address and password). Following the closure of an Xbox account, after 60 days, all downloaded content, games and applications will be lost. Whilst Microsoft have a ‘Next of Kin’ process this only supports their email accounts, they do not provide support for Xbox Live.